More than 50 years after Martin Luther King, Jr.’s famous “I Have A Dream” speech, many challenges of social justice persist today. Clarence B. Jones, advisor, counsel and speechwriter for King, will discuss these issues at UCF on Thurs., January 22. The event, which is free and open to the public, will be at 3 p.m. in the Cape Florida Ballroom of the Student Union. Jones has made significant contributions to American society. 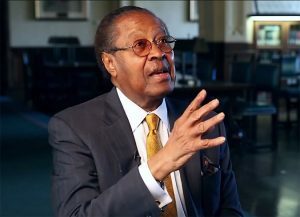 In April, 1963, he drafted the settlement agreement between the City of Birmingham and King to bring about the desegregation of department stores and public accommodations. He assisted King in the drafting of his celebrated “I Have a Dream” speech, delivered at the March on Washington. Jones also became the first African-American partner in a Wall Street investment banking firm, Carter, Berlind & Weill, Inc.
Jones is currently a Diversity Scholar and Visiting Professor at the University of San Francisco, and a Scholar Writer in Residence at the Martin Luther King, Jr. Research and Education Institute at Stanford University. He regularly writes for the Huffington Post, and has co-authored several books. Two of those books, What Would Martin Say? (2008) and Behind the Dream: The Making of A Speech that Transformed A Nation (2011), will be available for sale at the public forum. Jones will sign books and greet attendees after the event. This event, which is hosted by the UCF Global Perspectives Office, is the third and final installment of the UCF Civil Rights Series. The series, which celebrates the Civil Rights Act and its impact on the world, previously featured Cheryl Brown Henderson and Julian Bond. For more information about this event or others, please visit www.ucfglobalperspectives.org.